During the week he is Wittenborg’s student housing coordinator, but, when it comes to the weekend, Karel van der Zande is a qualified glider pilot with 27 years of experience and a love of the freedom offered by the open, blue skies. This summer, Van der Zande will take part in the 2018 Euroglide Race – a gruelling 2,350 km race, which will take participants from Venlo in the Netherlands to the north of Germany, then to the Czech Republic, the west of Germany and back to Venlo. Well, that is the plan if weather permits. In 2016, with the last race, Van der Zande and his team were forced to abandon the race halfway due to unfavorable weather conditions. 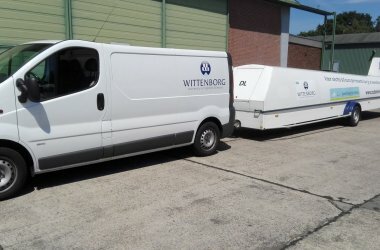 Like last time, Wittenborg University of Applied Sciences will sponsor the team. The race is due to take place from 2 – 13 July and is the biggest of its sort in Europe. More than 100 planes will take part in the spectacle. Van der Zande’s team consists of 6 people of which 4 are pilots. The plane will fly on solar energy although it also has a back-up engine. Van der Zande took his first flight back in in 1991. What is it like, up there, for him? Has he ever had an accident?